@Kasey_Cole14: @CherokeeSchools will you take my first born child in exchange for the cancellation of school. @CherokeeSchools: @Kasey_Cole14 Wow. I'm flattered, but not really looking for that kind of relationship right now. 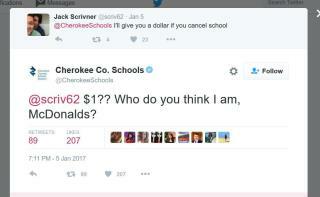 @CherokeeSchools: @scriv62 $1?? Who do you think I am, McDonalds? @CherokeeSchools: I have the club for you: drama. It's so you. @CherokeeSchools: @_maddietrousse_ Current chance: 0.0000000%. My superintendent very rarely closed school growing up. There had to be at least 6 inches. I lived at the base of a steep 1/4 mile hill in a rural area. In Elementary School the bus would drive down to pick me up. Guess they didn't want little kids walking so far to the bus stop. That changed in secondary school, but I digress. When it snowed, the bus couldn't get up that hill if there was more than 3 inches of snow, even with chains on, so my dad would drive me up to the top in his rear wheel drive coupe with 100 pounds of sand in the trunk. He'd punch it coming out of our driveway, got as much speed as possible on the flat and hope the momentum would carry us up the hill. The fishtailing was a blast! We'd be all over the road, flirting with the ditch on either side...the last 100 yards was the steepest, but luckily by that point there were some neighbor's houses, so if we got stuck, he could turn around in their driveway, drop me off, and go back down to the garage and put his chains on. Driving in the snow is a lot of fun when no one else is on the road!